PhotoModeler 2019.1.0 was released March 27th, 2019. This release contains 59 improvements and fixes! The significant improvement and new feature is the Pattern Capture Add-on for 2D template and pattern digitization. If you work with textiles and have a need to accurately digitize large patterns, then PhotoModeler Standard with the Pattern Capture Add-on (or PhotoModeler Premium) are a great way to go! In many textile industries and industries that fabricate complex 2D shapes, there is a need to digitize templates and patterns. More and more of the work of fabrication involves CAD and CAM. CAM involves computerized cutters and formers. Capturing a complex shape in the field or client site can be done a number of ways – one of those is a paper or mylar template. To get from a flat physical template to the CAD and CAM stage means digitizing the template pattern outline or drawn-lines. 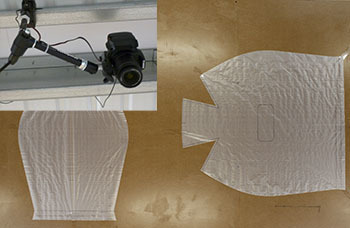 The ‘Use Photos to Digitize 2D Template Patterns‘ video provides a good introduction to the use of a camera for doing this digitization task. PhotoModeler has a long history of accurate use of cameras for digital modeling. While PhotoModeler is often used as a 3D modeling tool, the strong mathematical internals of PhotoModeler makes it ideal for efficient and accurate capture of 2D patterns. Some of the benefits of using a camera and PhotoModeler to digitize 2D templates are a) capturing large patterns, b) flexibility working in PhotoModeler or your favorite CAD software, c) accurate, and d) cost-effective. As well, when you have PhotoModeler and are ready to jump to full 3D measurement and templating you can do it with the same software! See Digitize 2D Patterns and Templates with a Camera for more background and a more complete list of benefits. In addition to manual digitization methods, PhotoModeler’s Pattern Capture Add-on provides a semi-automated method for tracing drawn lines and edges of materials. This tool is called Auto-trace and this video demonstrates how to use it. If you use computer-aided methods in your template-based business or are interested in moving in this direction, consider giving PhotoModeler and the Pattern Capture Add-on a try. In addition to the major new feature described above, there were 57 other improvements and fixes. The video loading system has been replaced and should be more robust and handle more video formats. Added a Delta Absolute Value column to the Check Distance table, which allows for better sorting to find the largest value regardless of sign. Some user interface operations dealing with large data sets are faster. If you are waiting on a particular fix or improvement you can see the whole list here. If there is anything we missed please let us know as we continuously work to improve PhotoModeler.